Are these structures White Elephants? The term “white elephant” is often used to describe things that are expensive with unusually high costs for maintenance. And even though this is completely contrary to the real history of white elephant giving, many still use the term. Actual white elephants are extremely valuable, amazing and very beautiful animals, so it is hard to understand how the term has devolved into such a meaning. Nowhere is the term white elephant used more than in describing large building projects that some feel are a bad investment or that seem to be aesthetically different. We found a list of structures, created by Amy Fowler, that are considered ugly – or maybe even one of those proverbial “white elephants”. The human race may be unique in its ability to build complex structures and, to an extent, master nature – but architects seem to be getting a little carried away with their power. Many modern buildings are, from a technical standpoint, amazing structures. They are complex and intricate – and some of them leave you wondering how they stay upright at all (let alone where the doors are to get in) – but that doesn’t mean that they’re nice to look at. Are these ten structures perhaps the ugliest ones in the world? This sculpture stands near the London 2012 Olympic Park. 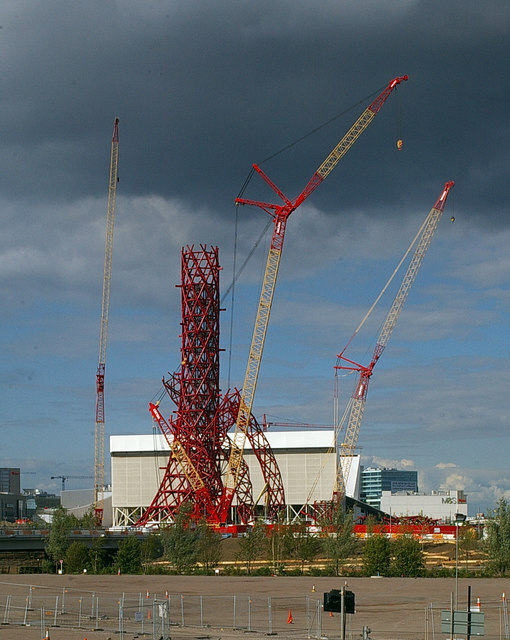 It was designed by Anish Kapoor and Cecil Balmond, and will be opening to the public soon. Abu Dhabi is home to some beautiful pieces of architecture, but this isn’t one of those pieces. 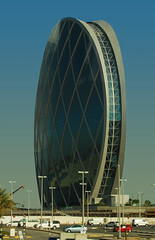 This huge, eye-catching building is the world’s first coin-shaped skyscraper. The Longaberger Basket Company must not think that their name is obvious enough. 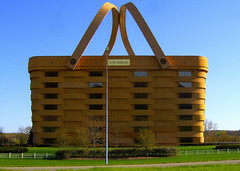 To ensure people knew what it was they did, they decided to have their headquarters made in the shape of a basket – including giant handles sticking out of the roof. The windows are fitted into the “weave” of the basket, as are the doors, so the look remains completely unbroken. 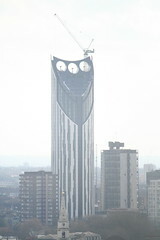 The Strata skyscraper in Elephant and Castle, London, dominates the landscape with its unusual shape and the turbine blades at the top. The Mirador building was designed by a Blanca Lleo, in conjunction with the Dutch architecture studio MVRDV. The building looks, at first glance, like a random mish-mash of lego bricks. There’s no symmetry, no clear pattern to the colors or textures on the walls, and no clear pattern to the positioning of the windows and doors either. If the designer wanted to drive people insane trying to understand the point of the building, they did a great job! 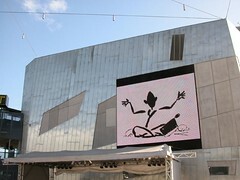 Federation Square in Melbourne, Australia has a distinctive look. In some ways, it looks like one of those origami toys that you might have tried to make as a child – only huge, and made of glass and metal. This Russian statue looks like something that Tim Burton would have designed – only instead of being a mildly scary cartoon character or plush toy, it’s a monstrosity that stands 15 stories high. 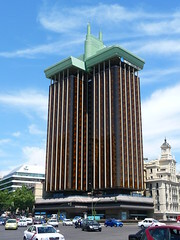 These matching towers dominate the Madrid skyline. They look vaguely like a set of salt-and-pepper shakers, held together by a giant plug. Horse shoes are supposed to be lucky, so people don’t resent this particular monument too much. This giant horse shoe stands over the shopping center in Tuuri, Finland. It’s said that people who visit the town itself (let alone the mall), will be blessed with good luck. This 105 story hotel is located in North Korea. Not only is it considered by many to be an eyesore, it was never completed. Construction started in 1987, and was expected to take just two years. Numerous delays plagued the project, and construction has stopped and started several times over the past 25 years. Written by Amy Fowler on behalf of oak door specialists, UK Oak Doors. For more from UK Oak Doors, join their Google Circles. Photos by Julian Osley, Paolo Rosa, Addicted Eyes, herbrm, druidabruxux, clickrunner, BBM Explorer, oligoquetos, Roquai, and Pricey.